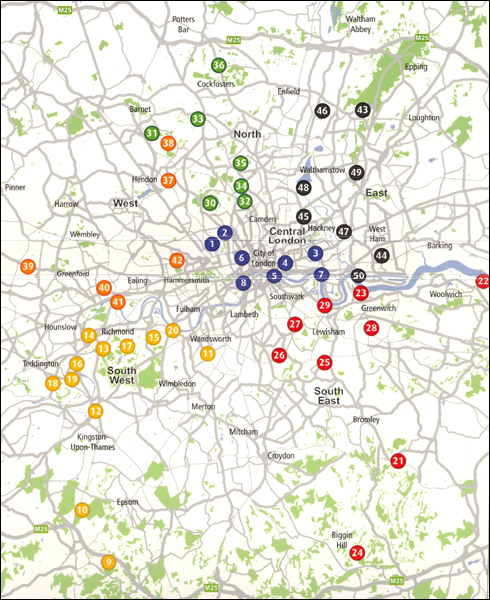 London WheretoRide describes and maps 50 cycle rides across the capital, incorporating the TFL cycle hire scheme, on GPS generated mapping, with elevation profiles and concise instructions in the form of prose descriptions, a ride log and an at-a-glance summary data page. 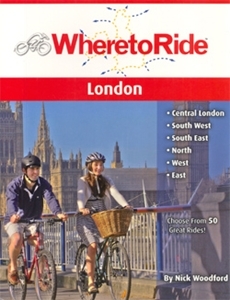 The guide is divided into chapters looking at routes in central, south west, south east, north, west and east London and includes a chapter on kid’s rides, as well as featuring tips for beginners, public transport information containing public transport maps and details about transporting you and your bike to and around London. Routes are marked in vivid red against muted grey street mapping and rated beginner, beginner/moderately fit, moderately fit, moderately fit/experienced cyclist and experienced cyclist. Terrain options are either path, on road, off road or MTB (more narrow and challenging dirt trails). Map legend shows kilometre distance markers, ride junctions at crossing points with other routes, bike docking stations and a selection of amenities and facilities including tourist information centres, transport links, walking tracks, car parks, toilets and bike shops. The at-a-glance data pages include details on route distance, total climb and terrain, with comments about traffic levels, how to get there, refreshment options and bike hire points.